We’ve reviewed WatchGang before, but this is the first month we’ve tried their $99 per month “Black” tier, promising higher quality watches valued up to $500. Our conclusion until this point about WatchGang’s Original tier was that the watches were fine, and matched your tastes well enough, but that for the money, you could likely do better picking out higher quality watches on your own. We wanted to see, though, if the “Black” tier perhaps offered something better or something more that would make WatchGang a truly valued service. 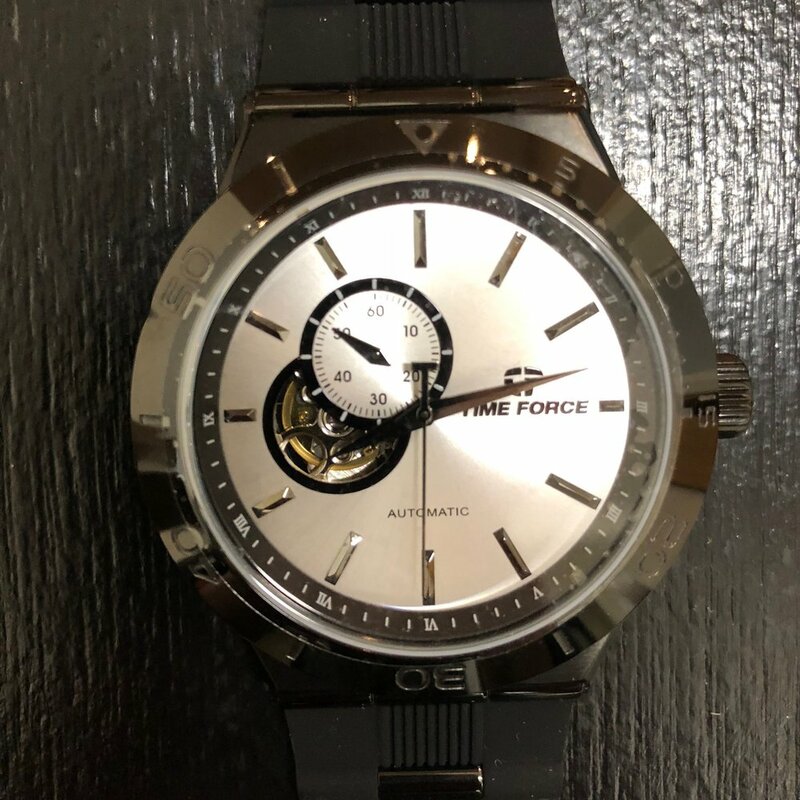 For the $99 + shipping I got a Time Force watch, which we’ll review below. I should take this time once again to point out that you need to pay for shipping, even at the Black tier. So, the $99 tier is more like $110. The watch came in a simple black box with no manual, no instructions, and no warranty card. 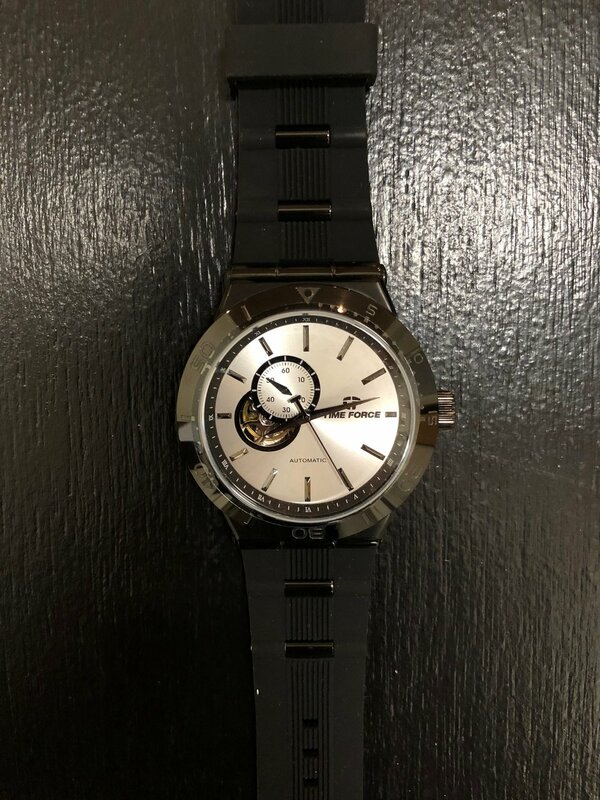 I was at first so sure that there had been a mistake and I was shipped an Original tier watch that I checked my profile to confirm that it was a Black tier watch I received. It was, but this is not how a watch should arrive. There should be at least something more than just the literal watch in a box, and calling it a day. There is almost no information about “Time Force” available online. From the little I could find, the model I got retails for about $450. We’ll discuss this value in its corresponding section below. As to the quality, in the first place, I am not a fan of how seemingly nonexistent this brand is. It’s one thing for a brand to be little-known. It’s another to hardly be able to find a single thing out about it. Still, that shouldn’t in and of itself dictate the watch’s quality. The watch is an automatic — something that you would of course not see in WatchGang’s Original tier — and even hacks (the second hand stops when you set the watch so you can set it to the exact second). Nice! Overall, the watch feels hefty, weighty, and definitely not cheap. However, if you’d like a lighter watch, this is far from it. It’s all around big and robust, not necessarily something I am a huge fan of. The metal finishing is all very nice, as is the crystal. In all, it certainly feels fine. Bottom line: The watch itself is certainly of respectable quality, but it’s a bit too big and heavy for my liking, and the strap is lackluster and difficult/impossible to swap out. Logo: In fairly big text, plus a logo, is “Time Force” right by the 3 o’ clock. I really do not like how this looks at all, and I feel it ruins the overall aesthetic of the watch face. Second hand: The second hand has a “T” shape to it. I like this, and think it is a cool, subtle way to incorporate the logo — if there wasn’t the actual logo taking up a third of the watch face also. Exhibition front window: There is a little circular window through which you can see the watch’s movement. This is very cool, and I like it a lot. “60” complication: I don’t know what to call this complication, likely because it is not a usual complication at all, and appears to me to actually be some sort of mistake. The hand within the complication moves relative to the time shown on the actual watch face. Thus, when the time is 12:00, the complication displays 60. When the time is 6:00, the watch displays 30. And so on. What the hell is the point of this, you ask? I could not tell you. I suppose some will argue it’s some sort of GMT complication, but… that’s not what this is. It does not show you time out of 24 hours. It shows you a relative time out of 12 hours. Someone was able to track down the user manual, and it literally just says that you can determine what quarter of the day you are in based on this complication. Why out of 60? Who knows! I sure don’t. This is a stupid complication that really feels like a mistake in the manufacturing process that was covered up. Other than that, the watch is nice enough. It’s got an off-white back, and non-numerals for the time. It also has a Roman numeral ring around the outside of the watch face, and a dial (that does not turn) around the front of the case. Finally, it’s got a nice exhibition case back, which is always a nice detail and something I enjoy. The watch is also about 45 mm wide, and rather thick as well — again, more than I would like in both respects. As to the strap: I absolutely hate it. It does not feel nice, but worse, it does not look nice either. It’s got strange pegs both beneath and above the watch, and a “ribbing” down the center that I think looks cheap. The clasp is actually pretty substantial and feels nice, but I think the strap just makes this watch look and feel so cheap. Bottom line: I don’t love the watch itself to begin with. It’s big and slightly bulky, has a strange complication, and a too-prominent logo. However, it’s not terrible looking in and of itself, but the rubber strap makes things even worse. For $450, I would not suggest anyone on the planet buy this watch. Which is good, because good luck even finding a retailer online that sells this watch. For the $110 I paid to WatchGang for this watch, though, I still don’t feel much better about it. (As far as my preferences go, by the way, I had a rubber strap set as my second most preferred option, with a NATO strap as number one. I had indeed wanted a nice rubber strapped watch. That is not this.) This is a watch that I am never going to wear. And I know about their whole WatchGang exchange Facebook group, but that is not something I really want to deal with, and it looks like everyone else got something from Time Force this month too. As far as WatchGang as a whole is concerned, we will have to see next month if they can recover, and if this was simply a fluke. I’m not sure they will be able to regardless, though, in my eyes. When you just paid $110 for a watch that you don’t like at all, and isn’t that great objectively, you feel stupid and played. Even if next month’s watch is great, what am I going to do about this month’s? Would it not have been better to take the $220 from both months and just buy a single watch I knew I would love? You can get something super solid for that kind of money. Then again, maybe next month's watch will be so great that I will change my mind on this. Truthfully, we will just have to wait and see. Bottom line: As it stands, WatchGang’s lowest tier has much lower stakes at its lower price point. The watches are not amazing, but worst case, it’s not that much money spent on a watch you don’t love. Plus, in the two months I tried it, I at least liked both of the watches. On the other hand, the lowest tier watches that I do visually like are not really the highest quality, and so I don’t always reach for them as I don’t feel great wearing them. So, for someone just getting into watches, WatchGang’s lowest tier might still be a solid option. Otherwise, I’m not sure exactly who it is for. Most would do better saving that money and buying either one (or a few) solid watches, or at least watches you know you’d like. As to the Black tier, like I said, it somewhat remains to be seen. But right now, thing are not looking great. If the Black tier is really a way to get “off the beaten path” watches that look and feel great, and that most people don’t have access to, then that is really something to consider. That’s a cool and unique service that brings value to people that enjoy and care about watches. Getting a really solid (all-around) watch you at least like every single month would be awesome. But that’s not what happened at all this month, and many on their Facebook group echo my sentiment. If they keep sending watches like this, I am not sure that WatchGang is for anyone at all. We will check back in next month!